Transparency is key to trust – so why would anyone hide behind a convoluted artificial grass cost? You’ve started thinking about transforming your property from a constant chore into a free space where you can finally start enjoying your life. Although installation of synthetic turf by a grass company can be a pricey short-term option for the average family, you’ll find that when you weigh the benefits of owning a synthetic lawn, the decision quickly becomes a smart long-term solution. Understanding the artificial grass cost involved when installing synthetic turf doesn’t need to be difficult. 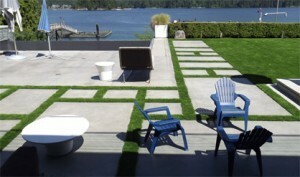 Most businesses in the synthetic lawn industry are still working off of the synthetic grass cost per square foot model. At Precisions Greens, we have found this model typically does not work towards the customer’s benefit and can result in hidden costs or overcharging. 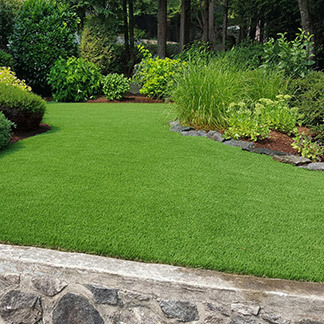 While the average synthetic lawn installation cost in the industry ranges between $10 and $20 per square foot, Precisions Greens’ grass price is calculated per project and will give you the best price for your value – guaranteed. By quoting on each individual job, we’ve eliminated any chance of running into issues resulting from unexpected obstacles and delays. This type of quoting has allowed Precision Greens to stay extremely competitive in pricing and workmanship within the synthetic lawn industry. 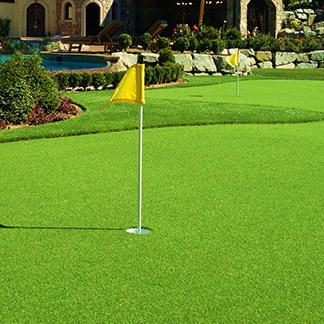 Why should you choose Precision Greens synthetic lawn? 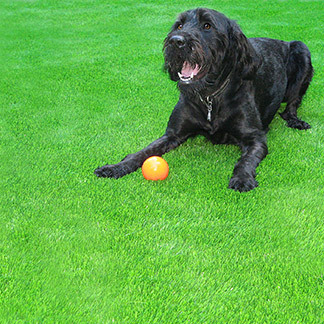 Synthetic lawn is pet and family-safe. You reduce the amount of allergens on your property by having synthetic turf installed. Synthetic turf is completely hypoallergenic. Our free, no-obligation estimates gives you insight before purchasing your synthetic lawn. Synthetic turf is a one-time purchase that can last decades and save you time. With our synthetic turf the mud stays outside and clothes stay grass stain-free. Instead of leaving you in the dark, let’s make this process as easy as possible. You want to buy grass for a synthetic lawn but what exactly are you paying for? Precision Greens’ synthetic lawn can help improve your life in numerous ways and it can last over 30 years. A one-time purchase can give your life back hundreds of hours – and we all know time is precious – and limited. 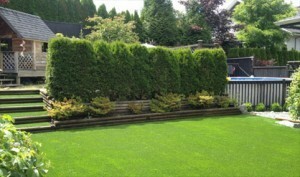 As leaders in the synthetic lawn industry and with over 3000 happy customers in Vancouver, Precision Greens is the benchmark for high quality synthetic turf across Canada. 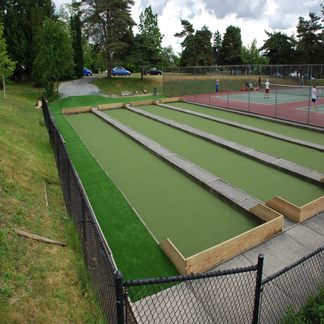 Our synthetic turf products guarantee customers are given the most durable and long-lasting synthetic lawn available. 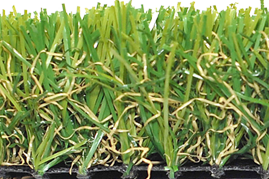 With these complex synthetic turf products comes research and development, manufacturing costs and more. If your synthetic turf is installed by an experienced professional then it can last over 30 years, while ones installed poorly are lucky to last 5. You might be thinking “Don’t you just roll out synthetic turf and call it a day?”; let me tell you – we wish it were that easy. 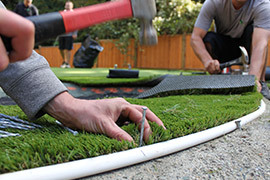 The installation process includes a variety of other costs and materials beyond just the synthetic grass cost. You have your base materials to create the foundation for your synthetic lawn, an optional underlay to offer more padding and safety, an infill to keep the fibers standing straight, synthetic turf spikes, seams and adhesive to secure your synthetic turf in place and the synthetic lawn deodorizer to keep your lawn fresh. What makes our synthetic grass unique? 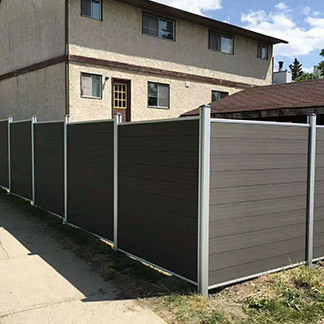 We offer free, no-obligation estimates. 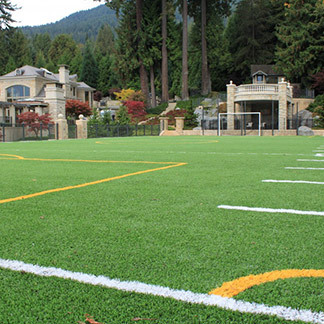 Our Synthetic grass and synthetic turf products are unmatched in workmanship. 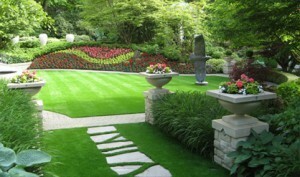 We guarantee you will be satisfied with your new synthetic lawn. We base our artificial grass price on a per project basis. But wait, we haven’t even covered the worst part – the installation includes a lot of back-breaking work. Before the work even begins you need to excavate any existing sod from the synthetic lawn installation and have it thrown out. Once your sod has been removed, base materials need to be installed and compacted down to a near cement that still allows drainage. Once that is done, the underlay still needs to be installed, the synthetic turf needs to be cut and secured, the infill needs to be spread on and the synthetic lawn still needs to be brushed and perfected. It’s a lot of hard work to install a perfect synthetic lawn, but once it’s finished, you’ll have the freedom to enjoy an exceptionally lush, vibrant and carefree yard for years to come! 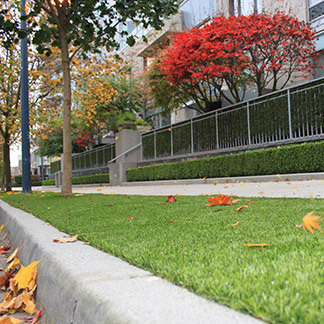 Synthetic turf has many, many benefits that can improve the lives of a wide range of people. Whether you’re tired of all the mundane yard work, want to let your pets have fun without the mess or looking to improve your health by eliminating allergies caused by your current lawn, synthetic turf is the solution. After years of creating new manufacturing processes and tweaking designs, synthetic lawn looks so similar to natural grass that you wouldn’t even know the difference if your neighbour has it. Your new synthetic turf can transform your yard, make your neighbours jealous and improve your quality of life all-round. Your synthetic lawn would look so perfect and lush all year that your neighbours would probably get a little jealous – I mean, they put a lot of time into improving their lawn and they never see you out there working on yours. We can help match you with the perfect artificial grass. Fill out the form below and the experts at Precision Greens will be in touch.